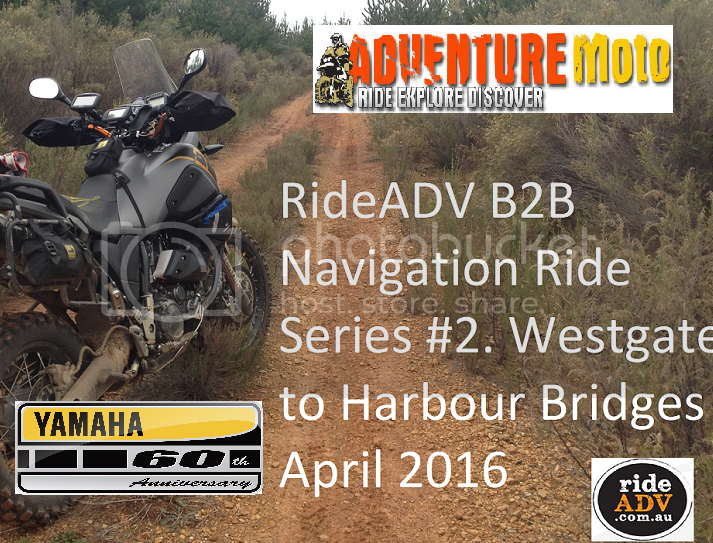 × Want to organise an Adventure ride or join up with the like minded, post your ideas here, times dates etc..
RideADV.com.au is proud to announce the next ride in the Yamaha Australia and Adventure Moto supported “B2B” (Bridge to Bridge) series. After the success of the 2014 Tony Kirby memorial B2B from Sydney to Brisbane, paying homage to the father of ADV in Australia, we are ready to announce the next B2B ride. The 2014 B2B was a great ride and is still talked about by many of our RideADV customers as the best ADV ride they have ever experienced. So in keeping with our mission of providing great value rides for our friends and customers and meeting the requests of the mob… B2B #2, Melbourne to Sydney (Westgate bridge to Sydney Harbour bridge) will be seven days of the best riding the east coast of Vic and NSW have to offer. Plan for Pub, Motel and/or camping style accommodation. It is a full navigation event with a luggage/gear truck and the usual array of fully equipped support vehicles with experienced drivers. We just want to help you enjoy it and do our best to keep you on track and safe home. Routes will be planned for each day with a “Standard” route suitable for larger bikes and those riders wanting spectacular scenery but with a less technical feel; and of course a “Special” more technical route suitable for riders on smaller bore bikes or competent riders on larger bore bikes and those generally wanting a little more spice on the ride. With all RideADV rides you can change between standard and special routes each night if you wish, just to make it interesting or to give you some breathing space. Both routes will have sweep crew and vehicle support. So come and join us for the 2016 B2B featuring the best of the Vic and NSW high country, Great Dividing Range, with ocean views, a toe into the central west NSW… and finishing under the iconic Coat Hanger… this ride has it all. Watch this space for more details and mark your calendars, as rider numbers will be strictly limited. For more information on this ride and our two and three day rides for the remainder of 2015 and early 2016, jump on the RideADV.com.au website. Anyone transporting their bike to Melbourne for this ride? I'm looking for a way to get my ktm 530 down there..